Just plug it in! Simply fill your ROTOSPA hot tub, plug it in and relax. No special wiring or elaborate foundation required. A ROTOSPA hot tub is fully portable – easily transport it from the cottage to your home and take the fun with you. Portability and simplicity do not mean sacrifice. 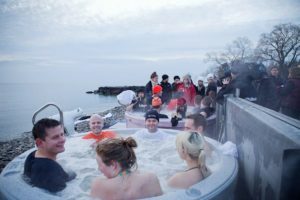 ROTOSPA is the truly full-featured portable, Canadian-made hot tub. If you are looking for quality AND affordability, look no further. As the value leader in the hot tub market, a ROTOSPA portable hot tub provides features not found on other tubs in its price range. And our fully insulated and sealed hot tubs are extremely economical to operate. ROTOSPA is designed with you in mind. Enjoy quality time with your family, entertain friends, relax as a couple, or take some alone time to unwind after a busy day. ROTOSPA provides the perfect environment. Let the powerful jets massage and heal your body and spirit. Create your own private oasis in your backyard!